Tag line: "There were three men in her life. One to take her... one to love her... and one to kill her"
The opening sequence of Sergio Leone's Once Upon a Time in The West, which features a showdown between Harmonica (played by Charles Bronson) and three trench-coated gunmen (Woody Strode, Jack Elam and Al Mulock), is a brilliantly paced, suspenseful bit of film making, punctuated with sharp, snappy dialogue. It's undoubtedly the most entertaining opening to a western I've ever seen, perhaps even the best ever committed to film, period, and was the perfect introduction to what proved a truly memorable experience. As the railroad pushes its way west, there are men pushing right along with it, draining as much money as they can from its rails. Frank (Henry Fonda) is one such man, a ruthless killer who won’t allow anything...or anybody...to stand in the way of profit. To obtain a valuable piece of property, Frank murders the current landowner (Frank Wolff) and his family in cold blood, then lays the blame for it all at the feet of another notorious gunslinger named Cheyenne (Jason Robards). But this isn’t Frank’s lucky day. First, the landowner’s new wife, Jill (Claudia Cardinale), whom the recently deceased married in a secret ceremony in New Orleans a month earlier, has just arrived by train, making her the legal heir to the dead man’s estate. Then there's the mysterious stranger, known only as Harmonica (Bronson), who's also just rolled into town. Harmonica has an old score to settle, and won't rest until he shoots Frank dead. Throughout it’s entire 165 minutes, Once Upon a Time in the West remains just as intense, just as witty, and just as exciting as its first scene. But a funny thing happens as the movie progresses. While you’re sitting there, smiling at the unrestrained volatility of it all, you begin to notice that Once Upon a Time in the West is also a very beautiful film, with sweeping panoramas that vividly capture everything it's western setting has to offer. Cinematographer Tonino Delli Colli framed the movie as if every shot, every locale, every detail was of the utmost importance, and before long, he has us believing it as well. As a rule, I usually watch a movie at least three or four times before I rank it among my favorites. Through the years, I’ve only made two exceptions, adding a film after a single viewing, and only because it was so staggeringly excellent that keeping it off the list would've constituted a crime. The first was Chungking Express. 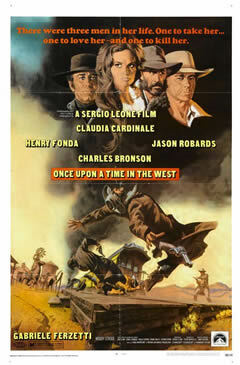 The second, Once Upon a Time in the West.